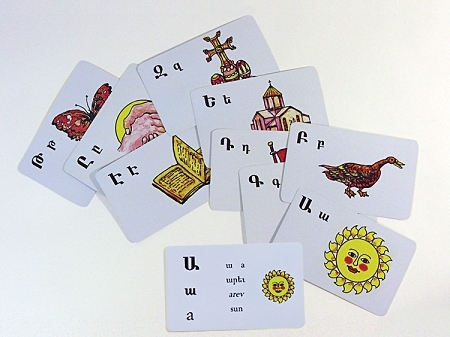 These Armenian Alphabet Flashcards, conceived by Gilda Buchakjian--the Armenian Studies Coordinator at the Diocese of the Armenian Church (Eastern)--are the perfect tool for children and beginners for learning the Armenian alphabet. Each letter is shown in capital and lower case form on glossy, laminated 3 1/2 by 5 1/2 flashcards. A picture illustrating a word beginning with that particular letter is also featured on the card. The word is transliterated and translated to make the learning process and memorization easier for the student.